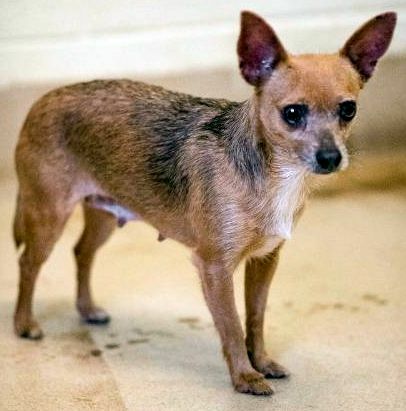 Notes: Gilly is a 6 year old female Chihuahua. She came from a 200+ dog hoarding situation, so she never got to interact with people very much. She needs someone to take the time to let her warm up to them, and show her that humans can be great. She does well with other dogs but would like a home that has no children. Dogs and Cats Forever, Inc. was organized in 1988 for the purpose of building and maintaining a shelter for homeless dogs and cats on the Treasure Coast. Our shelter is founded on the principle of trying to find good, adoptable and loving homes for the animals and help stop the killing of over 75,000 abandoned animals in southern Florida. With the increase of Florida’s population so too has come an increase of unwanted animals. Any pet not adopted will have a safe and permanent home at our facility for the duration of its natural life. No animal at Dogs and Cats Forever, Inc. will ever be sold for research, entertainment, or exploitation. We strive to end animal abuse and neglect. This charity is not connected with any other animal society. It is a not-for-profit, tax-exempt project totally dependent on donations and endowments. Officers and members are unpaid volunteers. All gifts are used locally and are greatly appreciated. Disclaimer: Although every effort is made to ensure these details are accurate, the webmaster and Chihuahua Rescue cannot be held responsible for any problems arising from the information displayed here.